So what happens at the MRF? We ask a member of staff…. 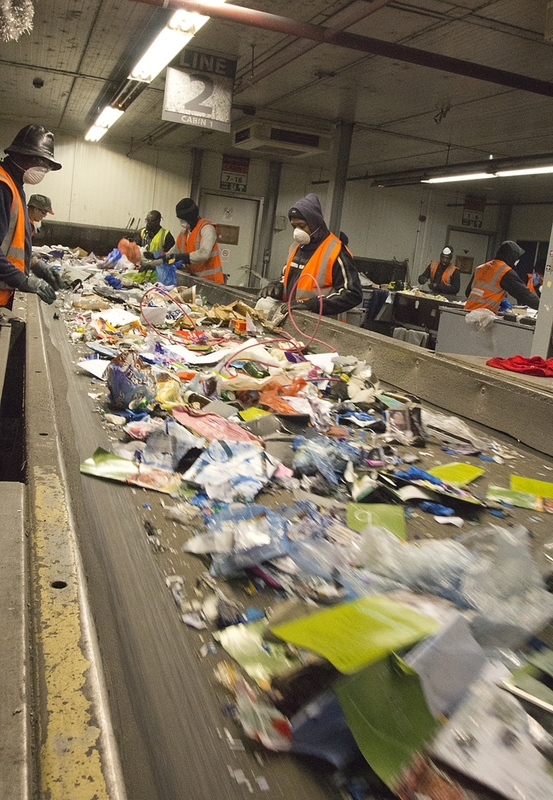 Unless you work in the industry, there’s probably no reason why you’d give your recycling or the recycling industry a second thought once you carry it out to the bin. 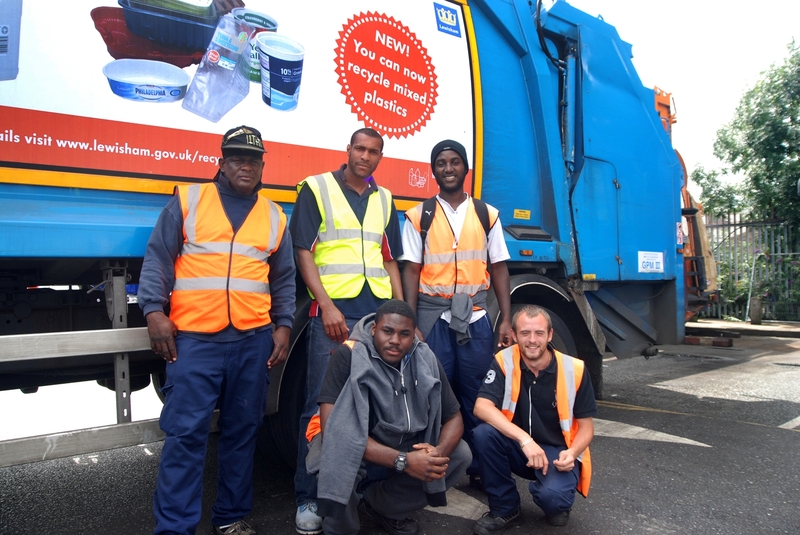 It’s hard to grasp the enormity of the recycling industry, not just the amount of recycling collected within Lewisham, but the workforce behind it. To get a feel for it we took a visit to the Materials Recovery Facility (MRF – or we like to say “Murf”). This is where all Lewisham’s recycling ends up and we met a few people who have worked there since recycling evolved in the UK. 29 years ago recycling in the UK was very different. Paul Pavett who’s worked at the MRF for all of these years describes how it used to be. “The industry’s expanded so much since I first started out 29 years ago and we’ve relocated 3 times in that time. Back in the day, we would get just 6 or 7 lorry loads a day to the site which was just really a waste transfer station. So most of the stuff coming in was just rubbish, but we’d pull out the scrap metal and cardboard by hand, and then dump the rest into landfill. Paul Pavett who’s worked in the business for 29 years and operates the grab amongst other machinery. Our second site was bigger and a MRF was fitted in, which primarily sorted out demolition waste where we’d pull out the metals, woods and anything of value, so there was a few more materials than cardboard but it was nothing like the sophistication of today. Confidential waste is shredded and baled ready for reprocessing. Took off indeed! 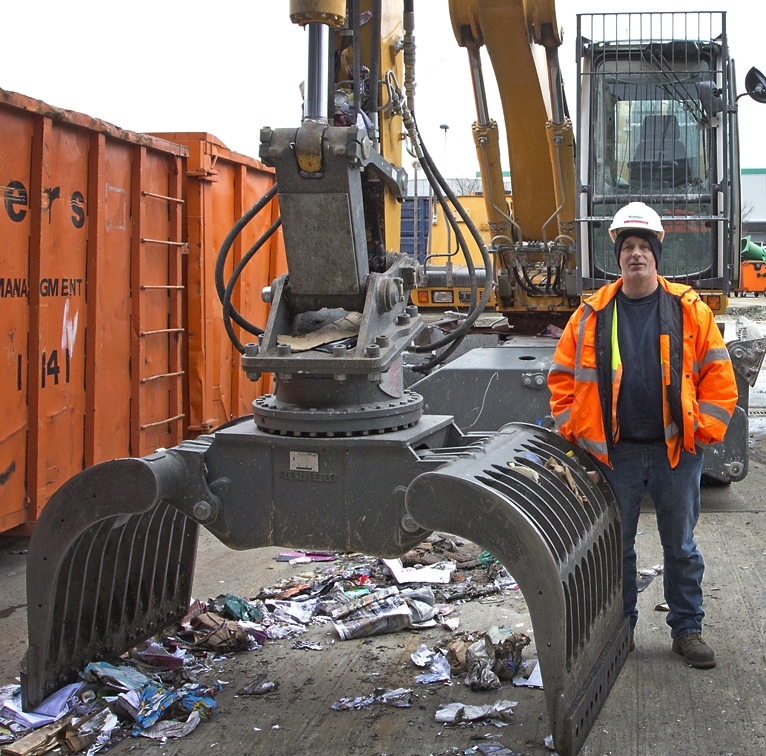 The MRF now employs over 400 staff, with people working within a wide range of skills. Paul has worked his way up throughout the years and has gone from sweeping up cardboard in the early days to the mechanics team where he manages and operates machinery such as forklifts, excavators and loading shovels and has qualifications in first aid and fire marshalling. In addition to the mechanics team, who ensure the sophisticated machinery is operating continuously, there are a whole variety of other teams, like drivers, environmental consultants and the financial team who look after 3,000 customers ranging from small businesses to local authorities. And very importantly there’s the people who work on the manual picking lines who are crucial to ensuring that your recycling is a quality marketable product. 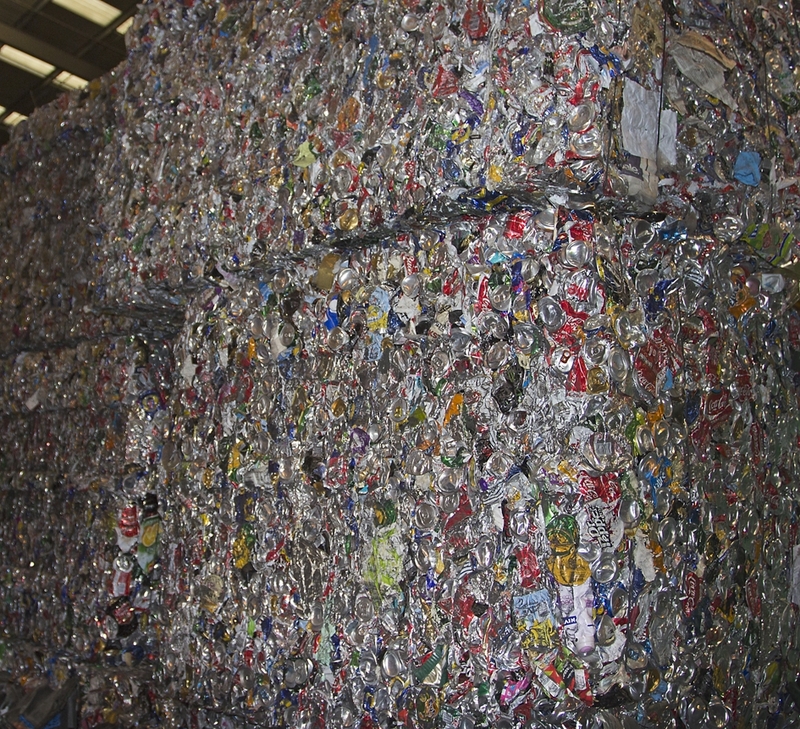 This final product is your recycling separated into bales, such as a bale of aluminium cans, or a bale of paper. It’s important for these bales to contain as close to 100% of the intended material as possible, or else it would be difficult to on sell to the reprocessing plants. A nice clean bale of aluminium cans. Unfortunately some residents contaminate their recycling with things that could damage machinery, be dangerous to people or simply devalue the recycling product. Food and garden waste that’s contaminated recycling can spread throughout the load contaminating much more than just one bin’s worth of recycling. Nappies can do the same and are extremely unpleasant for the staff to remove from the line. It’s those people on the manual picking lines who contend with these problems every day. An initial hand pick is done to remove any noticeable contaminants before it’s scooped up for the machine sorting process. 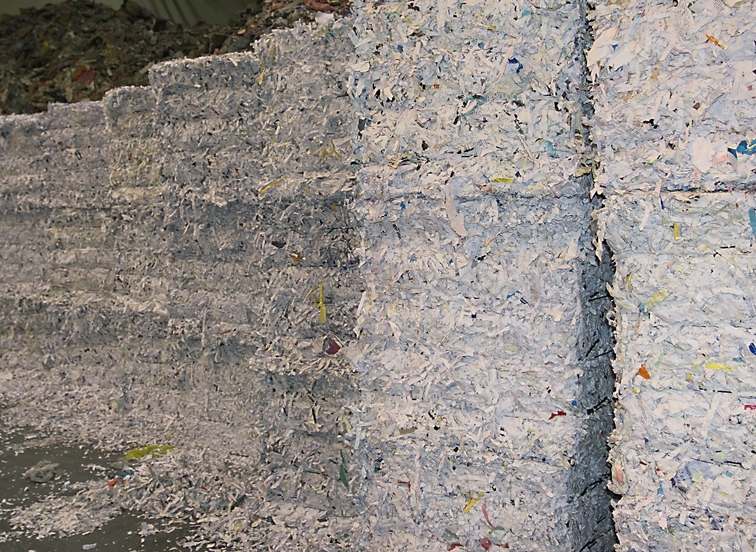 Even though the mechanical sorting process is highly sophisticated, separating card from paper, plastics from metals and so on, this process still requires a final quality check and removal of any nastiness that may have been missed in the other processes. Pickers see food and garden waste and also nappies which shouldn’t be in there. As Paul mentioned when being interviewed for this story, it’s amazing how over the last 20 or 30 years how recycling has expanded, even boomed and his message to everyone is to keep up the great work, but please keep things like food, garden and nappy waste out of the recycling process and recycle only those things that can be recycled. Categories: MRF, Paper, plastic bottles, recycling, Uncategorized | Tags: Bywaters, materials recycling facility, MRF, Paul Pavett, Pickers at a MRF | Permalink. This is a question that we hear a lot and over the years have tried to tackle it in all manner of ways. 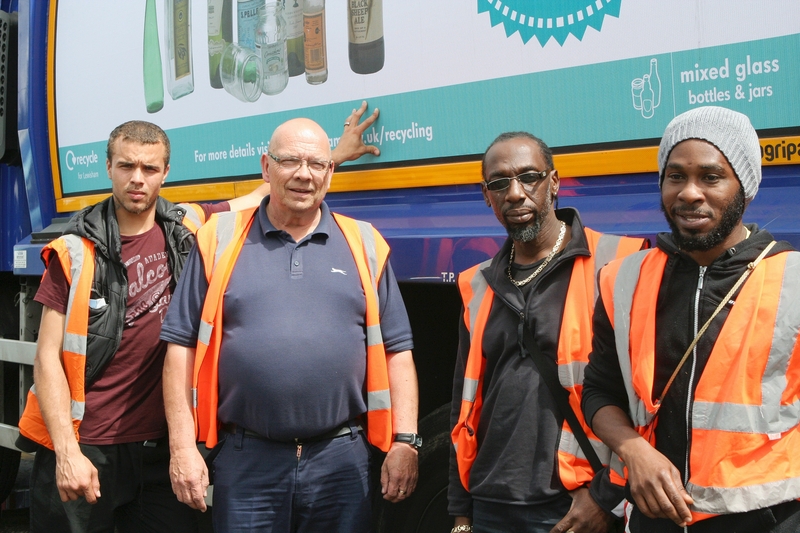 We have used traditional methods such as leaflets, put articles in Lewisham Life, used billboards and the side of our refuse and recycling vehicles. We have knocked on residents doors and taken our education trailer to large events and fayres in the borough. More recently we have moved into the area of social media with the use of Twitter and of course with this blog and we obviously combine them both for better results. We haven’t tried YouTube that much as a way of reaching people until now. So we went out into Lewisham High Street recently and approached residents about the recycling issues that they wanted answers to. The video below is the first in a series that we will be posting on this blog. The aim of the short film is to clarify and simplify just what we want our residents to do when it come to using the green bin, recycling batteries, composting and dealing with mattresses amongst many other things. Categories: Batteries, community engagement, Environmental Campaigns, Mattresses, Paper, plastic bottles, recycling | Tags: Ask Lewisham Council, David Brinson, Lewisham Council on YouTube, lewisham high street, Lewisham residents, Recycling in Lewisham on YouTube, Recycling on YouTube, vox pops of Lewisham residents, What can I put in my recycling bin?, What can I recycle in Lewisham?, YouTube | Permalink.